The purpose of our experiment was to investigate, if apparently healthy, vaccinated chickens may be involved in maintaining and spreading infectious bursal disease virus (IBDV) in poultry environments. We aimed at simultaneous detection and identification of very virulent field strain IBDV (vvIBDV) as well as vaccine strain IBDV in experimentally infected chickens. Two groups of specific pathogen free (SPF) chickens were vaccinated using the intermediate infectious bursal disease (IBD) vaccine D78. Group 1 was vaccinated at the age of one week and group 2 at the age of three weeks. Both groups were challenged with vvIBDV at the age of four weeks. A third, vaccinated, non-challenged group served as negative control. No clinical symptoms were observed in any of these groups. The chickens were euthanised and submitted to autopsy and sample preparation in groups of three at fixed intervals from the age of 28 to 44 days. Gross pathological lesions were not observed. Lymphoid tissues from the bursa of Fabricius, bone marrow, spleen and thymus in addition to cloacal- and bursal swaps were analysed by one-step reverse transcription polymerase chain reaction (RT-PCR). Positive results were confirmed by two-step strain specific duplex (DPX) RT-PCR. The vaccine strain was detected in bursa tissues from all groups, while the challenge strain was detected in few bursal as well as non-bursal tissue samples. The results indicate a possibility of replication of vvIBDV in vaccinated chickens. Fund af meget virulent IBD-virus hos vaccinerede kyllinger. Formålet med dette eksperiment var at undersøge, om vaccinerede kyllinger kan have betydning for tilstedeværelse og spredning af infectious bursal disease virus (IBDV) blandt kyllinger. To grupper specifikt patogen fri (SPF) kyllinger blev vaccineret med den intermediære infectious bursal disease (IBD) vaccine D78. Kyllingerne i gruppe 1 og 2 var henholdsvis én og tre uger gamle ved vaccinationen. Fire uger gamle blev begge grupper podet med meget virulent virus (DK01). En tredie gruppe, som kun blev podet med vaccine virus, blev brugt som negativ kontrol. Kyllingerne blev aflivet og obduceret tre ad gan-gen med fastsatte intervaller fra dag 28 til 44. Der kunne ikke påvises hverken kliniske symptomer eller patologiske forandringer hos nogen af grupperne. Lymfoidt væv fra bursa Fabricius, knoglemarv, milt og thymus, samt bursa- og kloaksvabere blev undersøgt ved one-step reverse transcription polymerase chain reaction (RT-PCR). Positive resultater blev bekræftet ved two-step duplex (DPX) RT-PCR. Vaccinestammen blev fundet i bursavæv fra alle grupper. RNA fra DK01 blev fundet i en knoglemarvsprøve fra gruppe 1 samt i tre bursa-prøver, en thymus og en bursa svaber fra gruppe 2. Resultaterne tyder på, at meget virulent IBD virus kan opformeres i og udskilles fra vaccinerede kyllinger. Gumboro disease or infectious bursal disease (IBD) is associated with reduced production parameters, increased mortality and immunosuppression in young chickens [9, 12, 22]. The etiological agent, infectious bursal disease virus (IBDV) is a small and very stable RNA-virus that may survive even thorough cleaning and disinfection of poultry houses . Two serotypes, serotypes 1 and 2 are recognised , of which only serotype 1 is pathogenic to the domesticated chicken. Extensive virus replication takes place in the bursa of Fabricius of the infected chicken, resulting in lesions in the bursa tissue and viremia followed by damage of other lymphoid organs: spleen, bone marrow, thymus and germinal centres of caecal tonsils . Lesions found in non-bursal lymphoid tissues are usually less pronounced compared to lesions in the bursa . The severity of the infection depends on the virus strain and on the susceptibility of the host, regarding age , breed  and antibody level . The most virulent IBDV strains cause severe but unspecific clinical symptoms including anorexia, depression, diarrhoea and high mortality rates three to six days after infection in three to six weeks old, susceptible chickens. The disease is mainly controlled by vaccination [26, 17]. Most of the Danish commercial breeders are vaccinated and serologically tested to ensure high and uniform levels of maternally derived antibodies (MDA) in their offspring. MDA and high biosecurity levels in all parts of the production intentionally prevent introduction and spread of diseases, including IBD. However, clinical outbreaks of IBD, defined as reported cases with typical clinical signs, increased mortality and pathological lesions including one or more chicken flocks in the same farm were reported from 1998  until 2003, interrupted by a 14 months break including 2001. Based upon previous experiences, vaccination of broilers in and around affected farms was recommended for up to three broods succeeding an outbreak. The vaccine strains were live, intermediate, attenuated IBDV strains. From March 2002 to February 2003, a total of 43 cases of clinical outbreaks of IBD were reported, involving approximately 10% of broiler producing farms in Denmark. Approximately one third of the flocks involved in these outbreaks had been vaccinated, 60% twice and 40% once, giving rise to questions concerning presence of virulent field virus in vaccinated flocks. For this reason, our experiment was aimed at investigating, if vaccinated chickens could contain virulent virus. High levels of maternally derived antibodies (MDAs) inhibit an active immune response towards vaccination [14, 18]. The level of antibody that a vaccine can break through depends on the vaccine strain . Mild vaccine strains are efficient only when chickens have no or very low levels of MDA, while the intermediate strains including D78, and the "hot" strains can break through higher levels of MDA titres . Chickens from more than one parent flock may be mixed in the same broiler house, adding to the variation in the level of MDA. Even anticipating optimal timing of a single vaccination, optimal vaccine quality and optimal handling of vaccines, some chickens in the flock may not respond optimally to the vaccination due to MDA. Consequently, broiler farmers are often advised to vaccinate a flock twice. The first vaccination is carried out early to benefit chickens with the lowest levels of MDA, while the second vaccination is carried out at a later age, when the highest initial levels of MDA have waned, often at the age of three weeks. Groups 1 and 2 in the present experiment represent early and late vaccination respectively. Considering that SPF chickens have no MDA against IBDV, we vaccinated group 1 at seven days, the earliest vaccination time recommended, to allow ample time for antibody production prior to challenge with field virus. Group 2 was only allowed one week to develop immunity before challenge, relying on the chickens' ability to produce virus-neutralizing antibodies three to four days post infection . This group had the advantage of a more mature age as to immuno competence  before vaccination. The objective of the present study was detection of virulent IBDV in lymphoid tissues and swab samples from vaccinated chickens indicating virus replication and excretion respectively. We used a commercial RT-PCR assay for detection of virus RNA, succeeded by a modification of a strain-specific RT-PCR assay recently developed at our laboratory . Fertile eggs from IBDV antibody-free SPF hens from Lohmann Tierzucht (Cuxhaven, Germany) were hatched in a controlled environment under laboratory conditions. The chickens were raised in isolators with filtered air-flow (HM 1500, Andersen BV, The Netherlands) and provided with unlimited access to water and a commercial chicken feed. A light programme ensured 18 hours of daylight interrupted by six hours of darkness after the age of one week. The vaccine strain Nobilis® Gumboro D78 Vet (Intervet International B.V. Boxmeer, The Netherlands) (D78) with a titre of 105 ELD50/ml was used according to the manufacturer's instructions; one dose was given orally to each chicken by syringe. A vvIBDV strain isolated from a Danish outbreak in 1998 , Gen Bank Accession No. AY850693 (DK01) was extracted from bursa tissues of previously infected chickens. The bursa tissues were homogenised in a mortar using a pestle and sterile sand. The homogenate was suspended in 10% phosphate buffered saline (PBS) containing 10,000 U/ml penicillin, 10,000 μg/ml streptomycin, 250 μg/ml gentamycin, 500 U/ml nystatin and 5% FBS (Invitrogen). After centrifugation for 15 minutes at 3000 rpm, the supernatant was collected and diluted in Hank's buffered saline solution (HBSS) (Gibco™, Scotland) to 10-1, 10-2, 10-3, 10-4, 10-5 and inoculated on the chorio-allantoic membrane (CAM) of embryonated hen's eggs to determine virus titres . The titre value was 104.2 ELD50/ml. After a 1,000 fold dilution in HBSS, 0.2 ml per chicken was inoculated as drops in the eyes, nostrils and beak. Twenty-four chickens from group 1 were inoculated with D78 at the age of seven days, and 24 chickens from group 2 were similarly inoculated with D78 at the age of 21 days. Both groups were challenged with DK01 at the age of 28 days. A group of nine chickens vaccinated at the age of 21 days and not challenged served as negative control. All three groups were observed twice daily for clinical symptoms. The chickens in groups 1 and 2 were bled and euthanised three at a time at the ages of 28, 29, 30, 31, 36, 38, 42 and 44 days. These chickens were numbered 1 to 24 in both groups. Chickens in the negative control group were sampled only on days 21, 30 and 38 and numbered 1 to 9. Euthanisation was performed in accordance with Article 2 (1) in Directive 86/609/EEC of 24 November 1986. Necropsy was performed immediately after euthanisation. Tissue samples from the bursa of Fabricius, bone marrow, spleen and thymus were removed and frozen at -80°C. Cloacal swabs were collected and frozen at -80°C. As RT-PCR results of cloacal swabs from group 1 and the negative control group turned out to be inconsistent (not shown), we decided to collect bursa swabs in addition to cloacal swabs from group 2. In order to estimate the analytical sensitivity of the two RT-PCR assays, the assays were applied to 0, 10, 100, 1,000 and 10,000 fold dilutions of RNA extractions from each of the virus strains D78 and DK01. Qiagen RT-PCR could detect RNA from D78 in 0, 10 and 100 fold dilutions, and from DK01 in 0, 10, 100 and 1,000 fold dilutions, whereas DPX RT-PCR could detect RNA from D78 in 0 and 10 fold dilutions and from DK01 in 0, 10 and 100 fold dilutions. As the results indicated that apparently the Qiagen RT-PCR performed with better sensitivity than the DPX RT-PCR, the Qiagen RT-PCR was used for the initial analyses. In case of at least one positive result within one type of samples, all similar samples from the same group of chickens were subjected to duplex (DPX) RT-PCR analysis to allow confirmation of the virus strain(s) involved. Agar gel immunodiffusion (AGID) was used for serum samples from all chickens, performed according to the OIE manual, 2000 . Frozen tissues were homogenized and suspended as previously described. Each swab sample was shaken in 2 ml of the previously described PBS solution for one hour before the swab was discarded. The suspensions were centrifuged for 15 minutes at 3000 rpm. RNA was extracted from the supernatants using Qiagen Rneasy® Mini Kit (Qiagen GmbH, Hilden, Germany). The protocol was modified as follows: initially 400 μl of sample supernatant was mixed with 300 μl of lysis buffer containing 6 μl β-mercapto ethanol (Sigma-Aldrich Co., Germany). This mixture was incubated at room temperature for one hour. From this point on the manufacturer's instructions were followed. The QIAGEN OneStep RT-PCR Kit (Qiagen GmbH, Hilden, Germany) was used according to the manufacturer's instructions. Briefly, 10 μl of a 5 × reaction buffer, 2 μl dNTP mix, 2 μl enzyme mixture, 100 pmol of each oligonucleotide and 5 μl of RNA were mixed with RNase-free water to a final volume of 50 μl. All ingredients were kept on ice during handling. The PCR reaction was performed in a Biometra T3 Thermocycler (Biometra GmbH, Germany) as follows: 30 minutes at 50°C (RT reaction); 94°C for 15 minutes (initial PCR activation); 39 three-step cycles of 94°C for 30 sec, 58°C for 1 minute and 68°C for 2 minutes; 68°C for 7 minutes (final extension). The iScript™cDNA Synthesis Kit (BioRad Laboratories, Hercules, USA) was used according to the manufacturer's instructions. Briefly, 5 μl of RNA extraction was mixed with 1 μM of RT primers , denatured for five minutes at 94°C, chilled on ice, annealed at 55°C for five minutes and chilled on ice. Fourteen μl of RT mixture containing 1 × RT buffer with 4 units of iScript Reverse Transcriptase were added, and after five minutes at room temperature the RNA samples were reverse transcribed for 30 minutes at 42°C, inactivated at 85°C for 5 minutes and stored at -20°C. Duplex RT-PCR (DPX RT-PCR) represents a modification of the use of primers in the multiplex RT- PCR (iScript) previously described by Kusk et al. (2005). 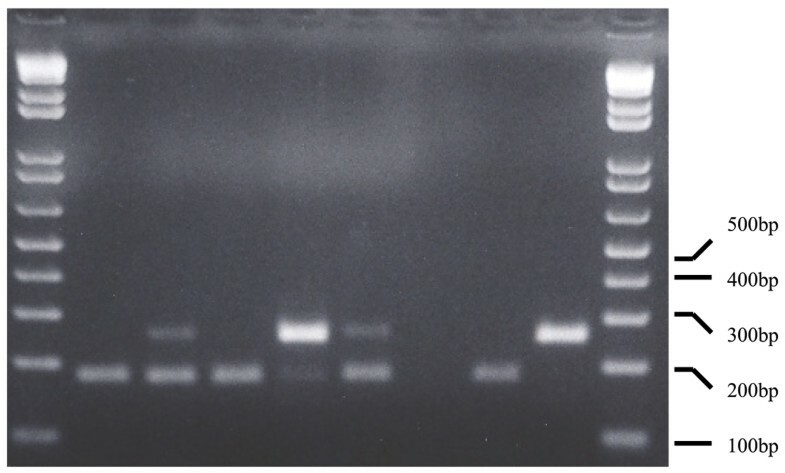 The primers included in the PCR mixture were only the four specific primers for D78 and DK01, D78-fp776, D78-rp955, DK01-fp775, DK01-rp1028, and the concentration was increased to 1 μM of each primer. No clinical symptoms were observed in any chicken involved in the experiment. Gross pathological lesions were not observed during the experiment. Serological analyses showed that all the chickens had seroconverted the first time blood was collected after vaccination (data not shown). RNA from IBDV was detected in 14 of 24 bursa tissue samples and one bone marrow sample in group 1. In group 2, 19 of 24 bursa tissue samples, two bone marrow samples, a thymus sample and four bursa swab samples showed positive results. In the negative control group, bursa tissue sample results were positive in three of six chickens. Negative results were obtained from thymus- and spleen tissues from group 1, spleen tissues from group 2, and spleen-, bone marrow- and thymus tissues from the negative control group (data not shown). The initial analytical sensitivity analyses indicated better sensitivity using the Qiagen RT-PCR assay than the DPX RT-PCR assay. Consequently, series of samples showing negative results when subjected to Qiagen RT-PCR were regarded as being truly negative and exempted from further analyses. As RT-PCR results of cloacal swab analyses were inconsistent after the samples had been stored, all these results were excluded. RNA from D78 was detected in bursa tissue samples from 10 of the 24 chickens in group 1 at the ages of 28, 29, 30, 31 and 38 days, and in a bone marrow sample from a 42 days old chicken. RNA from the challenge virus DK01 was not detected in bursa tissues from this group, but in a single bone marrow sample from a 44 days old chicken (Table 1). In group 2, RNA from D78 was found in all bursa tissue samples with one exception from day 42, while RNA from DK01 was detected in three chickens at the ages of 29, 31 and 44 days, respectively, as shown in Fig. 1 and Table 1. Analyses of non-bursal samples from group 2 revealed RNA from D78 in two bone marrow samples at the ages of 28 and 36 days, respectively. DK01 was identified in a single thymus sample of a 31 days old chicken. In the bursal swab samples, RNA from D78 was detected in six chickens at the ages of 28, 29, 30 and 42 days. The challenge strain was detected in a single bursal swab sample from a 31 days old chicken. DPX RT-PCR results of lymphoid tissue analyses from groups 1, 2 and the negative control group (Ctr), vaccinated at one, three and three week of age, respectively, and challenged with field virus at four weeks. The chickens were sampled in groups of three. DPX RT-PCR results of bursa tissues from group 2, samples No. 5, 12 and 24. Two fragments having a length of 179 and 253 base pairs respectively, corresponding to D78 and DK01 are visible. In the negative control group, RNA from D78 was identified in four of six bursas sampled at the ages of 30 and 38 days. Clinical outbreaks of IBD in vaccinated broiler flocks have caused concern in the Danish poultry industry. The reasons for these outbreaks could be high levels of MDA at the time of vaccination that would block responses towards the vaccine, or it could be improper practical handling of the vaccine, decreasing its effect or distribution, or new antigenic variant strains could be emerging. While these factors are most often investigated in connection with each outbreak, a potential reversion of the vaccine strain to virulence or survival of virulent strains in vaccinated chickens remains to be investigated. Continuous vaccinations contain a risk that vaccine strains may survive in the environment and regain virulence after passage in chickens . As vaccination of broilers has not been routinely used in Denmark, we speculated that in our case it was more likely, that surviving field virus might infect, replicate and persist in vaccinated chickens. Serum samples from the experimental chickens documented seroconversion before challenge, and as might be anticipated from previous studies, vaccine virus was detected in most bursa samples, contrary to the other lymphoid tissues . The detection of vaccine virus in bursa swabs from group 2 is concordant with the bursa tissue results and could be interpreted as excretion of virus. One bone marrow sample from group 1 and two from group 2 contained vaccine virus RNA, which cannot be explained by a mechanism connected to the challenge, as one sample was positive before inoculation with DK01. However, vaccine strain IBDV has been detected in non-bursal lymphoid organs before , and even though virus strain and lymphoid tissues were different, a difference in sensitivity between the MPX and DPX RT-PCR assays might explain this divergence with previous results . The load of D78 seemed less in group 1 than in group 2, probably illustrating that the vaccine strain gradually disappears from the tissues with time (Table 1). In the negative control group, vaccine virus seemed to be disappearing earlier than in the similarly vaccinated group 2, but the number of samples is too small for further interpretations. The virulent strain DK01 was detected in bursa tissues from three chickens from group 2, one of which also contained DK01 in thymus tissue and the bursal swab. Presence of DK01 in the bursa and thymus from group 2 and in a bone marrow sample from group 1 indicates virus replication in the vaccinated chickens in spite of successful vaccination. The number of chickens found positive for DK01 was small, however the number of experimental chickens was also of limited size. Our observations do not exclude that surviving field virus in a broiler house may infect, replicate and be excreted from vaccinated chickens. An observation on the same aspect but regarding Newcastle disease virus  concluded that vaccination does not prevent replication and excretion of challenge virus. Assuming that viable IBDV may be excreted under predisposing conditions including susceptible chickens, the final result may be a disease outbreak. Less field virus replication was observed in chickens challenged three weeks after vaccination compared with chickens challenged one week after vaccination, adding to the general recommendations of protecting vaccinated chickens from field virus as long as possible, allowing time for development of an optimal immune response. In conclusion, the simultaneous identification of RNA from D78 and DK01 in bursa tissues, and DK01 in lymphoid tissues and bursal swabs indicated replication and excretion of very virulent field virus from vaccinated chickens, suggesting an explanation to previous field outbreaks in vaccinated flocks. Further research into the impact of stress factors influencing dual IBDV infections under field conditions is in progress. Reprints may be obtained from: Susanne Kabell, Danish Institute for Food and Veterinary Research, Hangøvej 2, DK-8200 Aarhus N. E-mail: ska@dfvf.dk, tel. +45 72 34 68 36, fax. +45 72 34 68 49.